Compost is the heart of organic gardening. Most homesteaders sooner or later, want to make compost. Making compost is easy. Dig a hole or make a box and layer nitrogen and carbon – in ideal proportions (1 part nitrogen: 25 parts carbon). This heats up, feeding micro-organisms that transform the two ingredients into finished compost and rich stable humus. The finished compost can be added to your garden soil to improve its texture, nutrients, and water-holding capacity. With compost you can grow more vegetables and increase your harvest, which means more canning, more food self-sufficiency, and greater food security. Worm composting makes compost more efficiently. 1 pound of red wigglers will produce 150 lbs of worm castings annually, while simultaneously making more red wigglers. While there are still micro-organisms at work, the worms aid the work by consuming the nitrogen and carbon materials and pooping it out into finished compost. Worm castings are poop. When you feed your compost through worms, the compost is richer and higher in nutrients. And that makes your plants grow better and it gives you the satisfaction of transforming kitchen waste into a valuable resource. A bunch of red wigglers will eat half their own weight in food waste every day, and transform it into fertile worm castings for your houseplants or your garden. That means that a lb of red wigglers will transform 3 ½ lbs of fruit and vegetable waste every week into rich compost for your plants. 12 to 15 lbs of worm castings each month, after the first month while the worms are getting settled in. 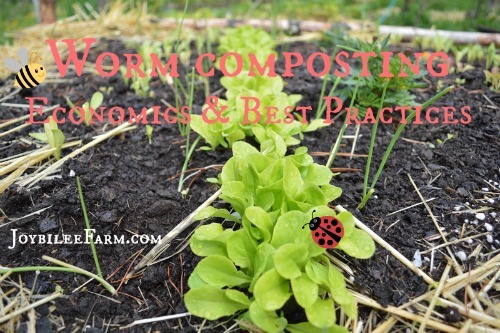 In a year your worms could give you 150 lbs or more of rich finished worm compost. In the process they improve the quality of the compost, increasing its nutrients. Doesn’t that sound like something all gardeners should do? But let me warn you worm composting isn’t for the faint of heart. The blog world is full of stories of dead worms and failed worm projects. Let me add my worm-momma failure. We built our own worm bin many moons ago, before the internet, using a plastic bin. We drilled holes in it for drainage and used shredded newspaper for bedding. I didn’t have any stories of failed worm bins to reference and I didn’t have a mentor to guide me. It worked well for a few years. I kept it in our unfinished basement so it was protected from freezing. We put it up on wooden blocks for drainage. When it got a little ripe smelling, we added more bedding. But after a few years, I fed it too much too fast and the worms drowned. It was a lot of work to keep the worm bin, trying to keep flies from breeding in the box and trying to keep the worms fed but not too wet. Worms are living organisms. Taking them out of nature and putting them in an artificial environment has it’s own rules and pitfalls. It was a learning experience. Our first worm bin was a single plastic container. Our second attempt at worm composting we set the single container into a second plastic tote to catch the drips from the first bin. This was actually less successful. There was less air circulation and the worms died. But since I was just grabbing them from the compost pile outside, I didn’t have to buy more. The worms seemed to love egg shells and orange peels. They reproduced inside them. Although they didn’t break them down in the same way that other food was eaten and cast off. Some sources say not to feed them citrus, so maybe that’s why our bin didn’t thrive. Perhaps the citrus oils were harmful to them. My second attempt at worm composting was adding red wigglers to the litter under our rabbit cages. This seemed like it was working. There was lots of straw and hay under the cages making the bedding exactly the right ratio for success. Unfortunately as the worms began to thrive, my chickens found them and cleaned them up. Happy chickens, but sad worms. And then we moved to a climate that gets -40C nights in January. I gave up the idea of worm composting and just let the red wigglers play in my hugelkultur beds. I’m happy to report that they are thriving all on their own in the hugelkultur beds. This kind of worm composting pleases me. At least it did until today. Yesterday I planted out my first of the season micro-greens. I used certified organic starter soil from the garden store. It had large hard bits of “compost” that I had to toss, as well as pieces of wood chips. While the bag was marketed as organic, I really have no idea if it actually is organic or if there may be chemicals, drugs, or even industrial pollutants in it. 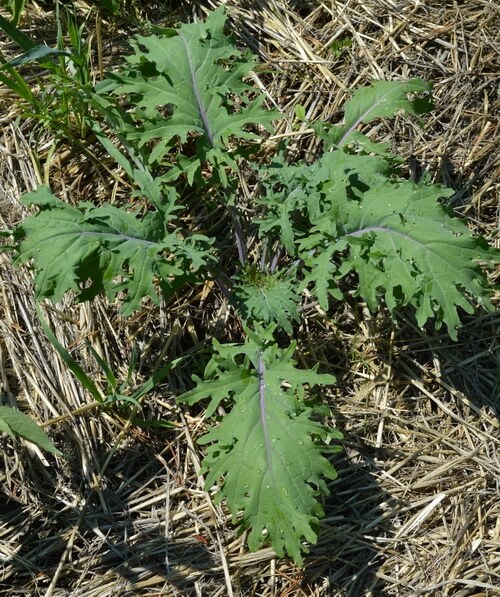 Even certified organic farms can have chemical drift. This less than ideal organic starter soil was over $30 for 25 lbs (4 cubic feet) at the local Home Hardware store. This made me want to explore worm composting again. It would be really awesome to be able to take my kitchen scraps and put them through a few worms and transform them into fertile potting soil via worm composting. And if I want to have it ready to use for my seedlings this spring, now is the time to start. My previous failed attempts at worm composting, however, make me want to do a bit more research before I jump in again. I started by checking out the great posts on worm composting at Homestead Chronicles. It was comforting to find out that Jo and Eddy experienced a similiar failure in their first attempts at worm composting. She had a lot of tips for success that she offered in a guest post over on the Homesteading Hippy’s blog. I found plans for a DiY worm bin at Good Girl Gone Green and a step by step worm composting tutorial and trouble shooting guide at Common Sense Home. My friend has a worm composting bin in her kitchen. She got the Worm Factory worm composting set-up. It is a magnificent plastic structure with removable trays. She feeds it a slurry of fruit and vegetable scraps every couple of days and takes drawers of finished worm castings out as she needs them for potting soil. Since it is a multilevel design, the worms migrate upward to their food source and you never have to actually sort them out of the finished castings. They sort themselves. The extra levels allow for adequate drainage, a problem I had with my very first worm bin. It is odourless, when managed properly. There is even a tap to pull off the fertile leachate for watering your plants. That’s a win-win. When I saw my friend’s worm composting bin I determined if I ever did this again, I’d do it that way. Just in the savings over buying potting soil, a worm composting set up like the Worm Factory 360 will pay for itself in a year. Welcome to the Eartheasy Vermicomposting giveaway! Vermicomposting is a great way to turn kitchen scraps and yard waste into nutrient rich fertilizer. The Worm Factory 360 is the ultimate worm bin for vermicomposting and tucks easily into a corner of your back porch or even the kitchen! Read more about how the Worm Factory 360 works here. Store your kitchen scraps in the handy stainless steel compost keeper and feed them to your composting worms each week. The worms start composting the scraps immediately and in a few short months you will have enough worm castings to harvest and fertilize your garden. You’ll no longer have to buy bags of compost at the store or worry about your standard compost bin freezing outside in the winter. Vermicomposting is the easiest way to make compost at home and this giveaway is the perfect way to get started! This giveaway is open to residents of the United States. (Sorry International and Canadian, friends.) You must be 18 years or older to enter. This giveaway will end on December 19th at midnight. When the giveaway ends, the randomly chosen winner will be contacted by email and have 24 hours to respond. If the person does not respond in the given time, another winner will be chosen. Good luck! Nice post! Quite informative and helpful. I’m considering to try worm composting and it was very interesting for me to read some more about worms. thank you for sharing this information! GREAT article. As far as my gardens are concerned, the more critters, the merrier.